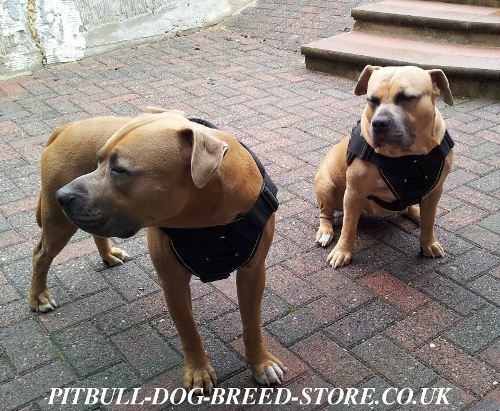 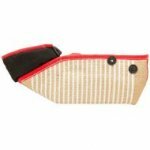 Choose such a dog harness for your Staffy that will share a load on the dog evenly, won`t press and rub anywhere, for example, armpits. 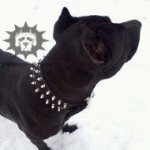 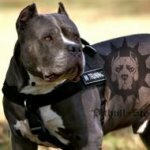 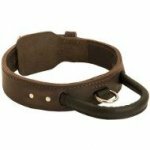 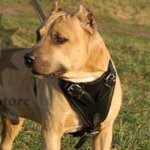 When you buy the dog harness, be sure that it won`t choke Staffy neck like a choke collar. 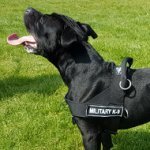 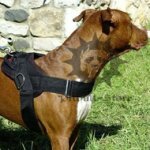 Halti harness can also cause neck injuries, though these injuries are of dissimilar nature than the injuries, which occure when Staffy wears a dog collar. 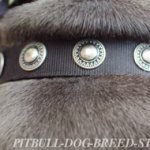 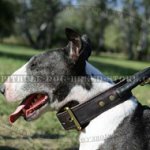 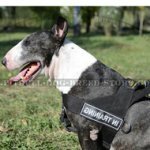 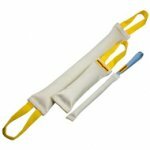 The injury caused from halti harness can occure, for example, at sudden neck turning or when Staffy wants to bite the end of a dog lead (the behavior in stress). 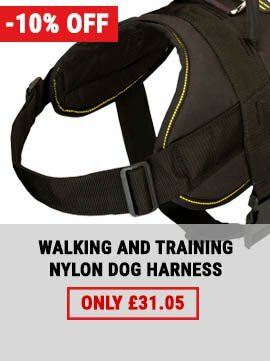 Don`t buy the dog harness with the straps on the neck. 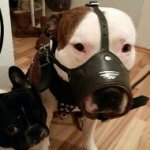 It`s no good to wear such a dog harness without the dog collar. 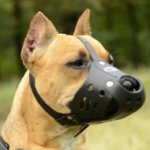 There are many humane advice about the pinch collar usage so that your Staffy will never pull. 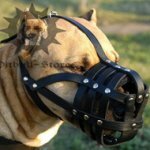 But if Staffy pulls once — all the pressure will be shared on some small points on the dog`s neck. 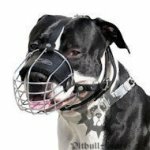 Thus it is not excluded that one of the points will get in jugular vein or throat directly! 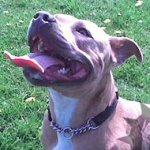 Electrric shock collars won`t also sovle the problem because of side effects, related to Staffy mental disturbance. 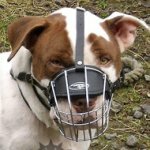 Shock collars are forbidden and are prosecuted in many countries for their cruelty and inhumanity. 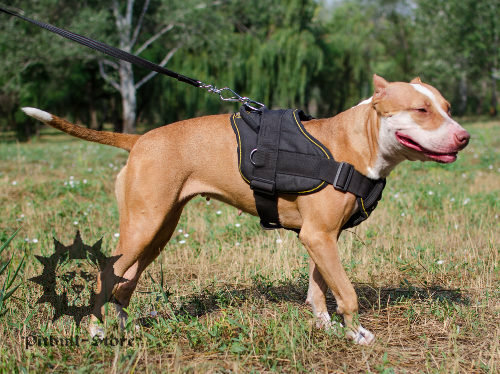 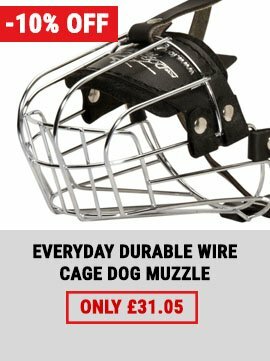 So if you don`t want to hurt your Staffy but you need to take it under your reliable control at the same time, then you have to choose a heavy duty dog collar and a strong dog harness with soft padding to provide maximum comfort for your beloved pet even during hard dog training. 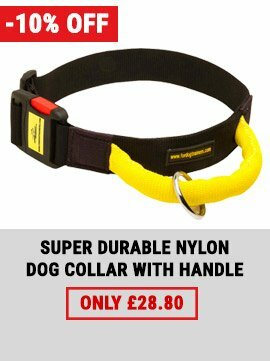 Choose safe and comfy dog products, click on the pictures! 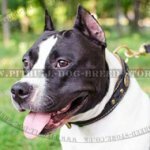 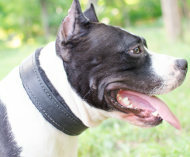 Read also our article about Staffy walking tips.